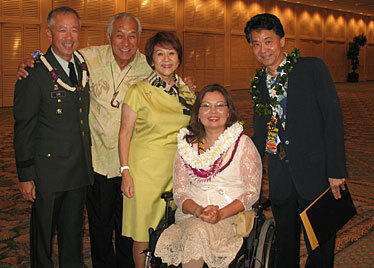 Maj. Ladda "Tammy" Duckworth (McKinley '85), seated, was honored last Thursday at the McKinley High School Foundation Tribute Dinner, a fundraiser for the foundation's scholarship program, at the Hilton Hawaiian Village Coral Ballroom. Maj. Gen. Robert Lee, left, introduced Duckworth at the start of the program, and Danny Kaleikini sang "Hawaii Ponoi." Linda Wong represented the scholarship honoring her father, the late Dr. Raymond Yap. Foundation President Carl Takamura, right, brought Duckworth on for the formal presentation, and she responded with an inspirational account of her experiences overcoming poverty in Hawaii and the loss of her legs in Iraq. Hawaii filmmaker Sharif Christopher Matar, left, welcomed Cary-Hiroyuki Tagawa on Sunday to the premiere of his full-length film, "Twain," at Dole Cannery, part of the Louis Vuitton Hawaii International Film Festival. Matar directed and co-wrote the fascinating local drama. Tagawa appears as an important secondary character. 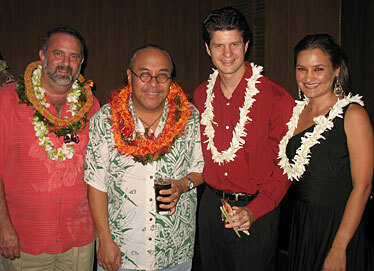 Allen Sviridoff, left, and Matt Catingub, second from left, were guests of honor Friday as Mountain Apple Co. celebrated the release of Catingub's new album, "Back to Romance," with a lavish CD release party at the Halekulani. Slack-key guitarist Jeff Peterson, an artist on the new album, enjoyed the event with his wife, Kahealani. Jefferson Finney shared the spotlight with Tuscany and artist Pegge Hopper on Saturday at a champagne party for his children's book, "A Clever Dog," at the residence of Prince and Princess Vittorio and Dialta Alliata di Montereale. Hopper did the colorful illustrations for the whimsical tale of a dog that dreams it can drive a car; Tuscany provided inspiration. 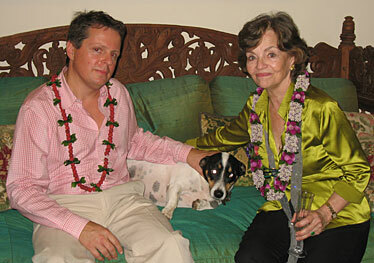 A portion of the proceeds from sales of the book and original artwork benefited the Hawaiian Humane Society. RAVES FOR "INTO THE WILD"
Lindsey Chun-Hori and Hawaiian KINE 105's Bill "Billy V" Van Osdol praised Sean Penn's new film, "Into the Wild," last Wednesday after catching a preview screening at Dole Cannery. Van Osdol said it was "a film that makes you examine the soul of humanity. I have a newfound respect for Sean Penn." Chun-Hori said she fell in love with the colorful cast of secondary characters.